Emit turns on the Aux particle system. By default, this option is set to Off. Choose either of the other options to activate the Aux System. At Bounce Event tells the Aux particles to be emitted at a collision event (set up in the Physics group). Continuously tells the Aux particles to be constantly emitted. Emit Probability sets how many of the main particles actually produce Aux particles. Probability is measured in percentage. Low values produce fewer particles. Higher values produce more particles. Left to right, Emit Probability is low and high. The Start and Stop Percentage controls define when the Aux particles appear in the life of the main particles. The Start and Stop values are a percentage of the Particle> Life [sec] value. For example, if Start and Stop are set to 20 and 80, then the Aux particles will appear starting at 20% of the main particle Life [sec] value and will stop appearing at 80% of the same value. A value of 0 and 100 respectively will emit Aux particles from the beginning to the end of the main particle's life. The following example shows a Start Emit value of 50. This means that the Aux particles don’t start emitting until halfway through the lifespan of the particles. You can see that newly born particles don’t emit Aux particles, so the particles around the emitter don’t have trails behind them. The Stop Emit value is left at its default value of 100, which means that particles will keep emitting Aux particles until they die. The next example shows a Start Emit value of 0, which causes particles to emit Aux particles from the moment they’re born. This causes particles with trails all around the emitter. But in this case, we lowered the Stop Emit value to 50, meaning that halfway through their lifespan, they cease emitting Aux particles. This causes particles further away from the emitter to not have trails. The Emit pop-up sets the rate of Aux particle emission. 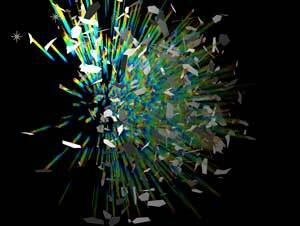 Particles are measured in seconds when Continuously is chosen. Particles are measured by collision when At Bounce Event is chosen. Low values create a low emission of Aux particles. Higher values create more emission and more Aux particles. Left to right, Particles/sec is low and high. Emit set to Continuously. Sets the initial velocity of the Aux particles at birth. Low values make the particles start slower. 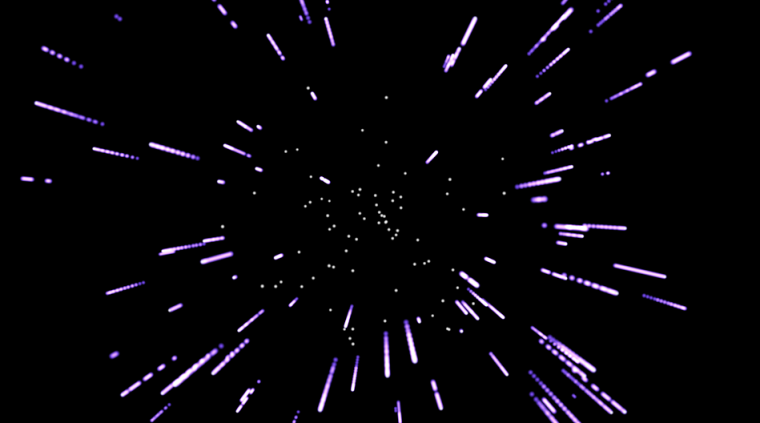 High values make the particles start faster. This parameter is sometimes referred to as 'Initial Velocity' in Trapcode Particular documentation. The Inherit Main Velocity control lets you add motion to the Aux particles. Inherit Main Velocity limits the creation of Aux particles based on the lifetime of the main particle. High values make the Aux particles move faster because they start out with, or 'inherit', more velocity. The main particle velocity is set in Emitter group> Velocity. Life controls the lifespan of the Aux particles, or how many seconds they live on-screen. Low values give the particles a shorter lifespan. High values give the particles a longer lifespan. Life Random adds randomness to how long the Aux particles live. Type chooses the Particle Type used by the Aux System. These are the same choices as the main particles, and now includes using Sprites or Textured Polygons. See the Particle Types page for an explanation of particles. The Same as Main option is active by default. This tells the Aux System to use the same Particle Type that the main particle system is using. This option is often helpful in keeping a consistent look to your composition. The main particle type is set in the Particle group> Particle Type pop-up. At left, main particle is Textured Polygon, Aux particle is Same as Main. In middle, main particle is Textured Polygon, Aux particle is Star. At right, main particle is Star, Aux particle is Same as Main. When selecting a sprite or textured polygon option from the Type pop-up, the Choose Sprite button will become active. Click that button to launch the Sprites presets browser window. 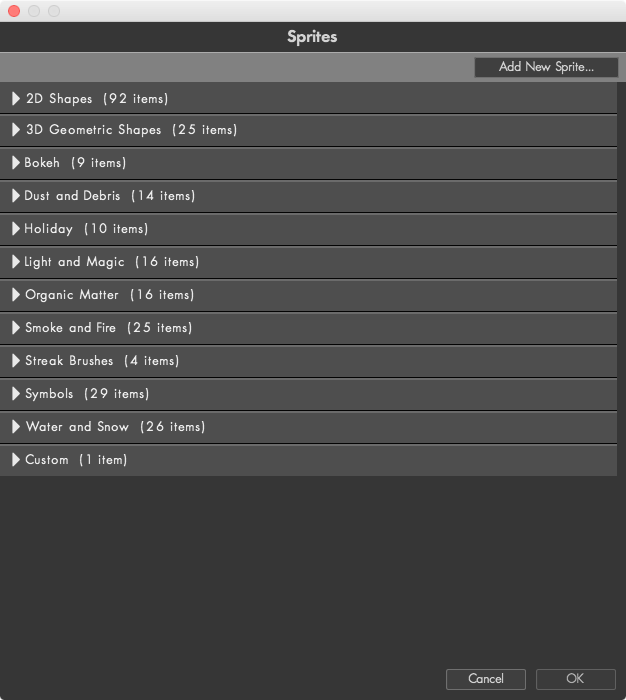 For more information on these presets, see the Using Presets page. 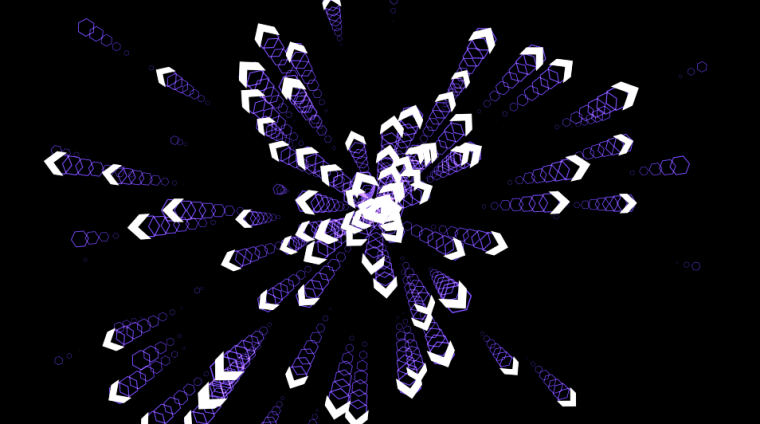 In this example, the main Particle Type is a Sprite (a white chevron from the included sprites presets). The Aux particles have their Type set to Sprite Colorize. The sprite here is a hexagon (also from the included sprites presets), and is colored purple. Being able to emit sprites from other sprites opens up a lot of creative possibilities. This section is only active when a sprite or textured polygon option is chosen in the Type pop-up. The Texture subgroup gives you all of the controls you’re used to having with sprites and textured polygons, only for Aux particles. This chooses the source layer that will be used as a 'texture' or custom particle for your Aux particles. All other Texture group parameters affect the image loaded into Layer. By default, the Layer pop-up is set to None and turned off. To turn it on, just click the Choose Sprite button, or choose a layer from the pop-up box. This layer has to be in your Timeline, and the View (eye icon) should be turned off for that layer. For more details on using layers as textures, see the Texture group page in the Particle Group section. Time Sampling determines which frame of the layer is sampled to generate the custom particle for the Aux particles. There are 11 modes. 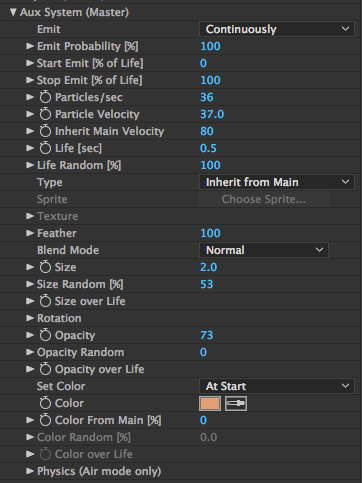 The mode determines which frame the custom particle is sampled from with options for starting from the first frame, picking a random frame, or splitting the layer source into multiple clips. The default choice is Current Time. If the custom particle is a still image, the mode should always be set to Current Time. This option will speed up rendering because the same frame of the layer is used for all particles in the current frame. When using an animated particle, the other modes are useful. The Start, Random and Split modes can drastically reduce the time needed to pre-render the custom particle layer. Following is an explanation of how each works. The Start modes all begin at frame one (the 'start') of the custom input layer. Start at Birth - Play Once: Plays the custom layer from start once. The particle may die before the custom layer ends, or the custom layer may end before the particle dies. Start at Birth - Loop: Plays the custom layer from start and restarts (or loops) if the layer ends. Start at Birth - Stretch: Plays the custom layer from start and time-stretches it so it ends exactly when the particle dies. The Random modes pick a frame at random to use. 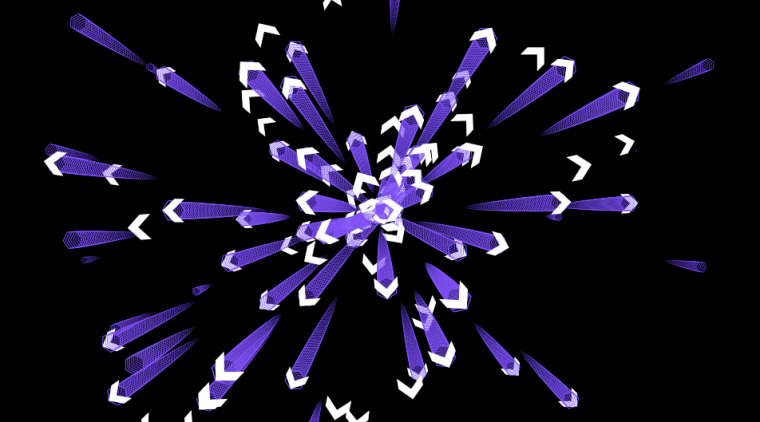 Random - Still Frame: Selects a random frame from the custom layer and uses it throughout the particle's life. Random - Play Once: Starts playing the custom layer from a random frame, and then plays at normal speed. The particle may die before the custom layer ends, or the custom layer may end before the particle dies. Random - Loop: Starts playing the custom layer from a random frame, and then plays at normal speed. If the custom layer ends, it loops and restarts from the beginning. Split Clip modes split the custom layer into a number of clips. The number is set the parameter Number of Clips. For example, if the custom layer is 30 frames and Number of Clips is set to 3, that means the custom layer will be split into three 10 frame clips. This is useful for creating a set of animated particles. Split Clip - Play Once: Randomly selects one of the clips and play the clip once. Split Clip - Loop: Randomly selects one of the clips and play the clip looping. Split Clip - Stretch: Randomly selects one of the clips and time-stretch it to fit the particle life. Current Frame Freeze: Holds the referenced particle image at the current time throughout the particles life. So any particles born at a certain frame will have that same appearance throughout the particle's life, even though the input layer may be animating. This happens at each frame. Active when any of the Random Time modes are chosen in the Time Sampling popup. Random Seed randomizes which frame it is sampling from without changing the positions of the particles. 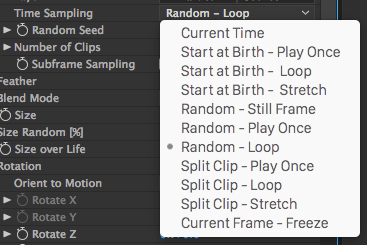 Active when any of the Split Clip modes are chosen in the Time Sampling popup. Defines the number of clips in the custom layer that Split Clip uses. For example, you may have 5 movies that are 10 frames each in a pre-comp. You may then select a Split Clip mode and set Number of Clips to 5. This will tell Particular to use just one of the 5 clips as the custom particle. Active when any of the Play Once, Stretch or Still Frame modes are chosen in the Time Sampling popup. This allows subframe sampling for the custom particle layer. This is useless if the custom particle is a movie, but if it is an animation, the plug-in can retrieve frames that are in-between frames. Sets the softness of the Aux particles. High values give a feathery soft edge to the particle. Lower values give a more globular, solid edge. See a similar example on the Glow group page. The Blend Mode controls how Aux particles are composited together. There are three options: Normal, Add and Screen. See a similar example on the Glow group page. Normal. The normal composite operation. Add. Particles are added together. Useful for light effects and fires. Screen. Particles are screened together. Useful for light effects and fires. Left to right, Normal mode, Add mode. Size sets the size of Aux particles. 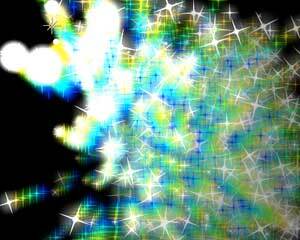 High values create larger particles. Size Random adds randomness to the size of the Aux particles. Size over Life controls how this Size varies over the Aux particles' lifespan. Read more on the Using Curves page. Similar to what is found in the Rotation group of regular particles, these controls allow you a lot of control over the rotation and orientation of your Aux particles. Orient to Motion lets the Aux particles orient to however they are moving. For example, arrows can point in the direction they move. By default, this setting is turned Off. Turn it on with the On option. Rotation X. Sets the rotation around the x-axis. Only enabled for Textured Polygon. Rotation Y. Sets the rotation around the y-axis. Only enabled for Textured Polygon. Rotation Z. Sets the rotation around the z-axis. Enabled for Textured Polygon, Sprite and Star. Adds randomness to the Rotation setting. More specifically, this parameter rotates the Aux particles around a random axis. Useful for getting a more natural looking effect where all particles have unique orientation in space. You can set the Aux particle's Rotation Speed separately on each axis. 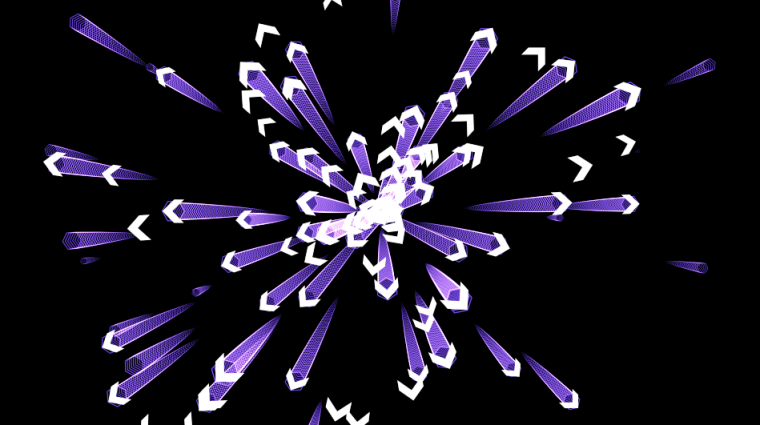 High values make the particles rotate quickly. Low values make the particles rotate slowly. Rotation Speed X. Rotation speed on the x-axis. Only enabled for Textured Polygon. Rotation Speed Y. Rotation speed on the y-axis. Only enabled for Textured Polygon. Rotation Speed Z. Rotation speed on the z-axis. Unlike the Rotation group for main particles, this single Rotation value controls rotation only around the Z axis. 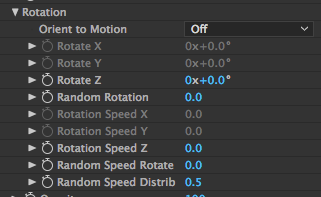 When keyframing this parameter, all Aux particles born at a certain frame will get the current Rotation Speed. Enabled for Textured Polygon, Sprite and Star. There's even a Random Speed Rotation which makes the Aux particles rotate using random speeds. Some of them will rotate fast, some slower, which is very useful in giving a natural appearance, for instance when making explosions. Enables fine-tuning of the randomness of Rotation Speed. The default value of 0.5 is the normal, Gaussian distribution. Setting the value to 1 will give a flat, even distribution. Opacity sets the opacity level of Aux particles. High values give a higher opacity. Low values give more transparency. 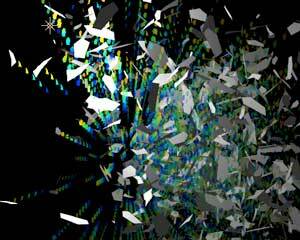 Opacity sets a randomness factor to the opacity of the Aux particles. Opacity over Life controls how this Opacity varies over the Aux particles' lifespan. Read more on the Using Curves page. Color sets the coloration of Aux particles. Enables Aux particles to inherit the color from the main particle that created them. Measured in percentage. 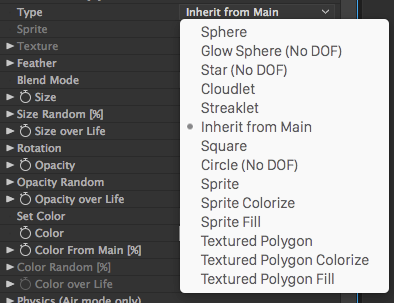 High values inherit a lot of main particle color. Low values take on less main particle color. The main particle color is set by the Particle group's Color controls. Left to right, Color From Main set low, Color From Main set high. Note: in the main particle color is set to red. Adds randomness in the color of the Aux particles. Color over Life controls how this Color varies over the particles' lifespan. Read more on the Using Curves page. The Physics Air group gives the Aux particles separate settings for three controls in the Physics> Air group. This lets the Aux particles take on different physics-based behavior than the main particles, which can make your animation more interesting. There are four controls in this group. Gravity makes the Aux particles fall downwards in a natural way. 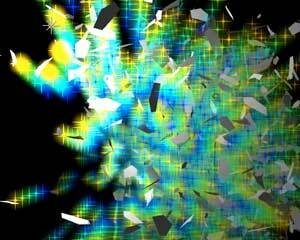 The particles pick up speed as they fall, just like any object in real world would. Low values make the Aux particles fall slowly. High values make the Aux particles fall more quickly. Air Resistance will modify the value set in Aux System> Physics> Air> Air Resistance. A value of 0 adds no air resistance. A value of 255 causes full air resistance modification to just the aux particles. Wind Affect is a multiplier that will increase the Aux System> Physics> Air> Wind motion in X, Y, and Z space for the Aux particles. Wind Affect is measured in a percentage. With values less than 100, Wind Affect decreases the Wind motion speed. With values greater than 100, Wind Affect multiplies and increases the Wind motion speed. For example, a Wind Affect value of 80 causes the Aux particles to move at .8 times the Wind values in the Physics> Air section. A value of 275 will multiple the Wind values by 2.75 times the original speed. Turbulence Position is the same setting as Affect Position value in the Physics> Air> Turbulence Field group. However, this Turbulence control only changes the Aux particles offset by the Turbulence Field. It does not affect the displacement of the main particles.